I can’t even count how many times we’ve been to Austria in the past years, and guess what, we’ve hiked there for the first time only this summer. We, the crazy hikers. Usually we went to Austria for skiing in the winter. And beautiful Vienna, our favorite European city is also a good excuse. But no more excuses any more. 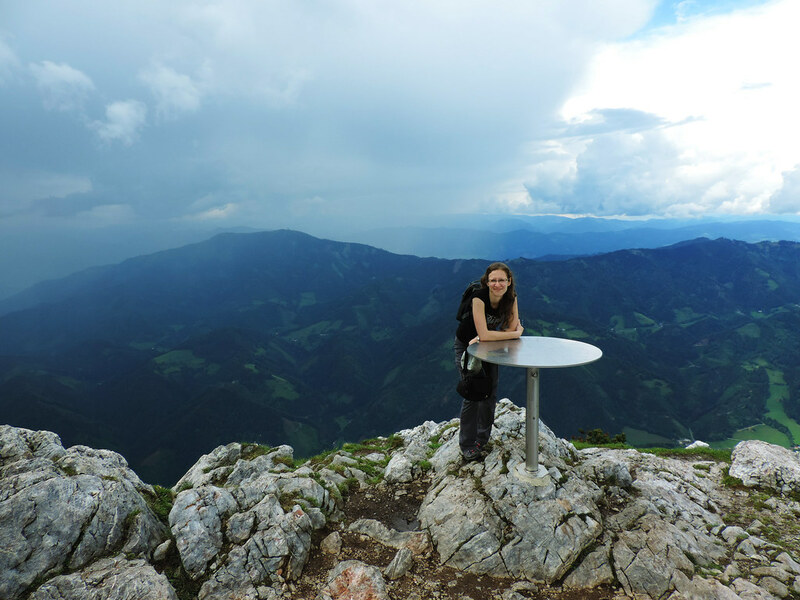 Our first hike in Styria was one that screams for us to go back again! Bärenschütz Gorge (Bärenschützklamm) is one of the most famous gorges in Austria. Climbing in the glen with sheer vertical walls rising up to 300 metres around you is definitely something. Of course, the charming waterfalls also have a fair share in the popularity of this trail. There’s about 20 of them! 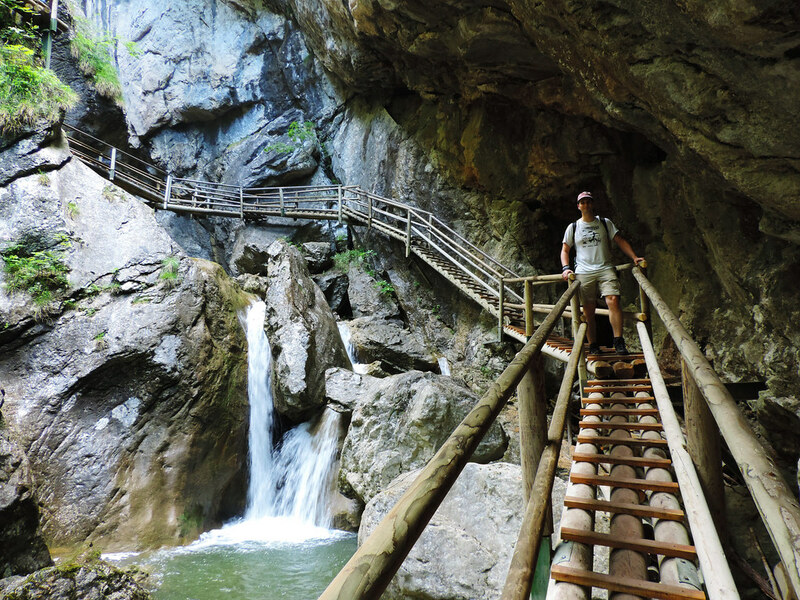 More than a hundred of wooden bridges along with ladders altogether about 1300 meters long make it possible for average people to visit the glen. Even with the bridges and ladders this hike is not a very easy one, but it doesn’t require professional climbing skills and the wonderful glen could be explored safely. So is it really such a strenuous hike? It’s not an easy question to answer in general. We would rate it to medium difficulty, the altitude change is 350 metres and there’s opportunities to stop from time to time if you need some rest or just want to enjoy the amazing views. We’ve also seen families there with children and I would call it a family friendly, safe and exciting hike. On the other hand, climbing ladders for about an hour is definitely not for everyone. The bridges are narrow and this trail is a one way trail: up! So you won’t really have a chance to turn back. This is not to scare you away, this is just what you can expect. The trail starts from “Gasthof zum Bärenschütz” restaurant near the lovely town of Mixnitz. If you drive to Mixnitz there will be signs posted for Bärenschützklamm and you will notice several parking lots. It’s pretty easy to find the trailhead from there – or you can just follow the crowd, it’s a popular hike. We reached the entrance of the gorge after an hour-long hike in the forest along a charming little creek. We even saw some small waterfalls just to give us a taste about what’s coming next. 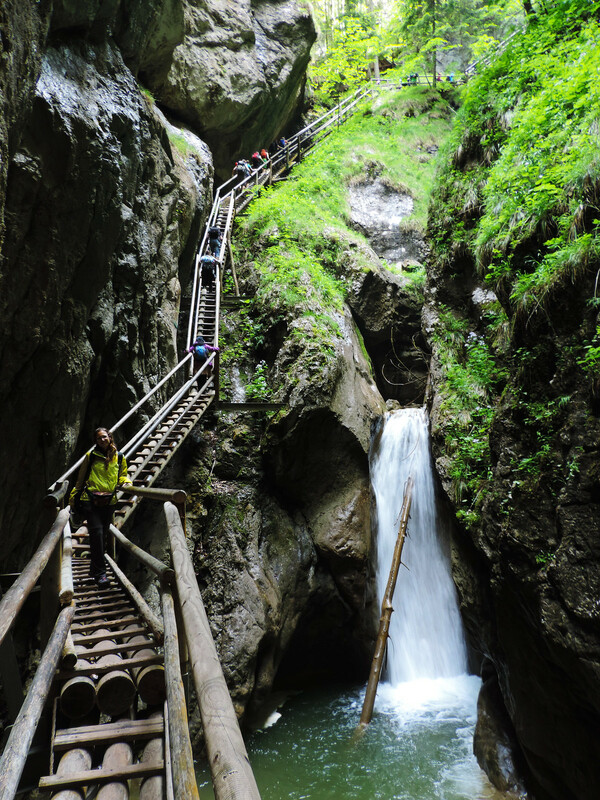 And then came the stunning climb along Bärenschütz Gorge with its fascinating waterfalls! We lost track of time here and the hike in the glen seemed so short. After the final goodbye to the gorge a 20-minutes hike led us to “Guter Hirte” restaurant where Prügelweg, the downhill route starts. But we didn’t feel we want to go back to the parking lot so soon. Okay, actually it was around 1 pm, but that still meant plenty of time until sunset. Luckily, several trails start from “Guter Hirte” restaurant and we chose the one to Hochlantsch, a 1722 meters peak. The weather was very cloudy and it was not the innocent white clouds we were worried about, but the dark grey and purple ones in the distance. Oh, they were not even very far, so we headed back and prepared to get soaked. We were happy to only have several light rains in the end and we even bumped into mountain goats on our way down. This extra adventure to Hochlantsch and back added maybe 3 hours to our hike and it was absolutely worth it. 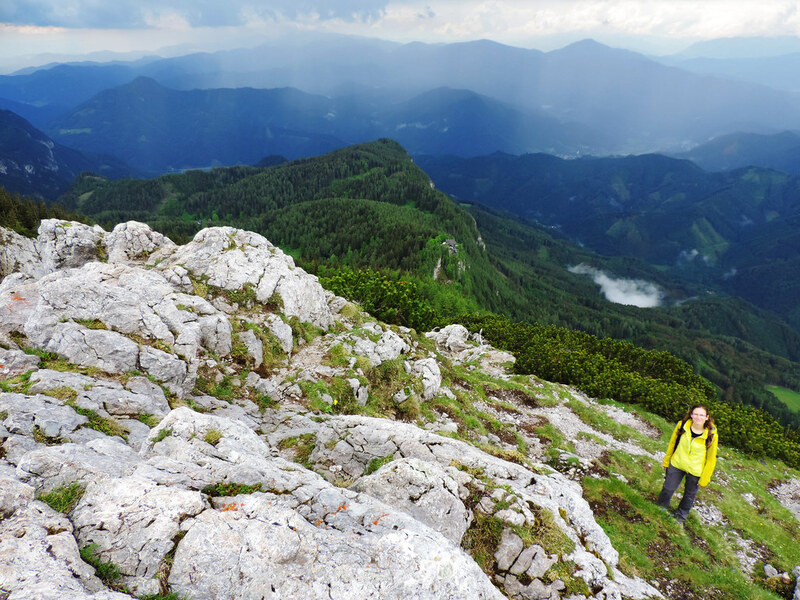 We got the only thing we missed during the glen hike: the wide panorama of the mountains of Styria. 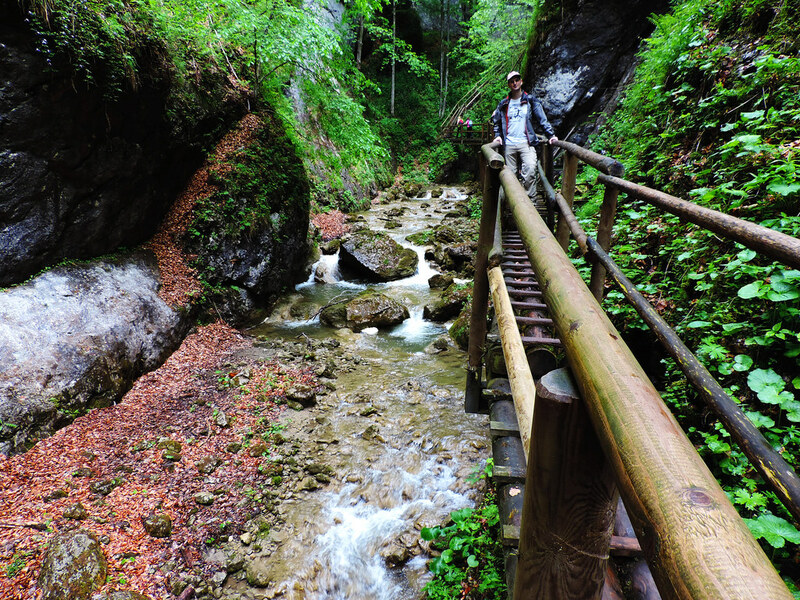 Bärenschütz Gorge is open from May to October, but we recommend to check the exact dates and opening hours on its homepage. Within this period we voted for early June and didn’t regret. 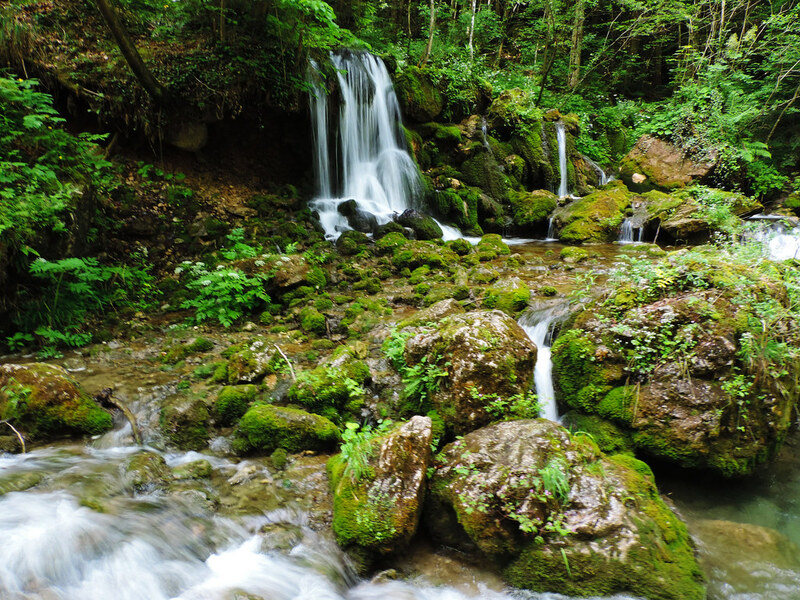 You know, thaw always do good to waterfalls, they are the most impressive in spring and early summer. Do you have a favorite glen hike? In Search Of Europe’s Prettiest Mountain Village: Hallstatt, Austria + Giveaway!